It is officially February, and if you have lived in Arizona long enough you should be familiar with the fact that the “Arizona Spring” is right around the corner. The last month brought us some cold temperatures, even a few freezing nights, but the days are getting warmer as the sun stays out a bit longer each day. With grass and plants starting to come back to life after a few cold months, it also means that weeds are going to start popping up. The sooner you can handle any weed infestation, the better. As weeds grow, they drop more seeds that will turn into their own weeds within days. We recommend taking care of them before they are even an issue. Using pre-emergents now will keep your yard free of weeds. Keeping weeds from showing up is important so that you aren’t spending the next few months pulling weeds while the temperatures soar into triple digits! We recommend using our custom blended fertilizers for your landscape needs as they are specifically formatted for Arizona soil and weather conditions. Good Rule of Thumb: Check the soil up to 3 inches deep. If it is dry, then it is time to water. This vibrant evergreen is certain to give any landscape year-round attractiveness. The silky, dark green leaves create a wide-spread awning that creates an abundance of shade. This is a perfect choice for the Arizona desert environment due to its love of heat and its drought tolerance. Available in both single or multi-trunk varieties, Brazilian Pepper trees are water-wise and require little water once established. 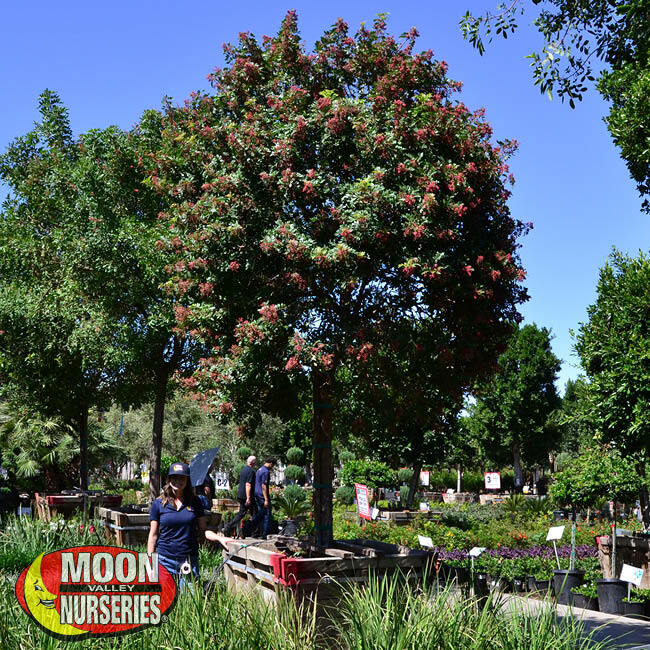 The Brazilian Pepper tree attracts butterflies and hummingbirds looking for a snack, so sit back in the shade of your Brazilian Pepper and appreciate these incredible visitors. Indian Laurel Columns are an excellent choice for creating a living wall no matter the reason. Need privacy or shade? Look no further. 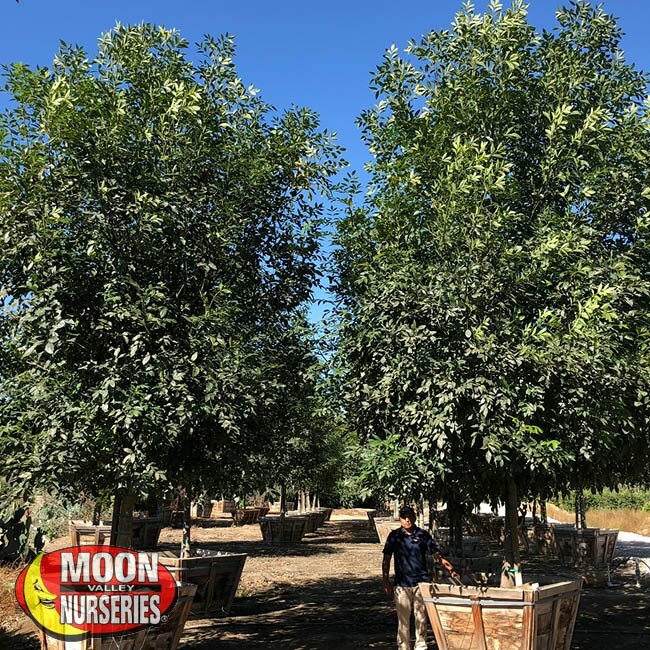 These drought-tolerant Ficus Columns have dense evergreen foliage that works well for blocking unwanted sights and sounds as well keeping your yard and home cooler, thanks to these fast-growing trees. They are easy to prune, so you can keep them on the smaller side for topiary purposes or tall and majestic – whichever fits your style and landscape needs. Grown to thrive in desert environments, Ficus Nitida Columns are sure to add greenery to our arid Arizona landscapes and get attention from your neighbors. 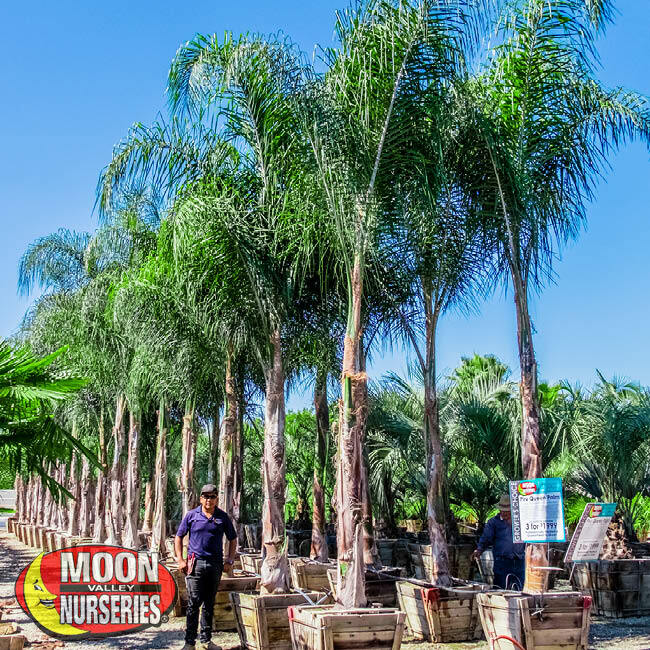 Specially grown at our tree farms, the Piru Queen Palm is unlike other Queen Palms around. Our Piru Queen Palms feature thicker and hardier trunks, denser and greener fronds, and produce fuller crowns. Our Queen Palms can handle hot summers, cold winters, and windy days. The palm is supported by a thick trunk which makes it ideal in tight spaces around your pool, but it does require overhead space as the palm grows to statuesque heights. These palms will create a luxurious feel to any property! Not only do they look great, but they are able to handle any weather conditions without any problem. Around pools, the Date Palm provides excellent shade due to its wide large umbrella-shape, fronds and extremely minimal litter. 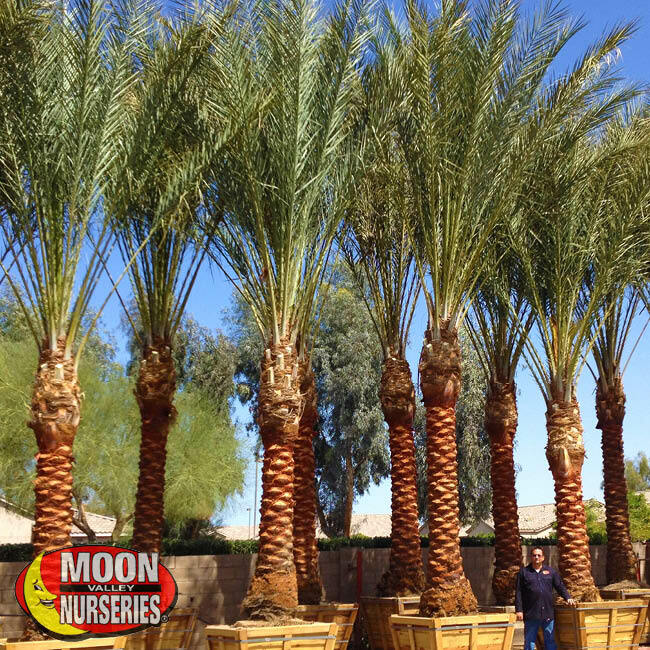 The Date Palm looks great when planted in clusters of 3 to 5 palms and is hardy to cold, heat and drought tolerant. Date palms will add a resort-style feel wherever they are planted! This Majestic Ash tree is an evergreen seedless variety that stays greener than other ash varieties. They feature large, glossy green leaves and its narrow, upright shape makes it an ideal shade tree for any potential planting locations. Because these trees are low-maintenance and virtually pest-free, it makes them ideal for a yard or street plantings. If you are expecting and hoping for a large canopy of shade to provide a play area for your children or for a way to escape the afternoon sun you will not be disappointed in the Majestic Ash. 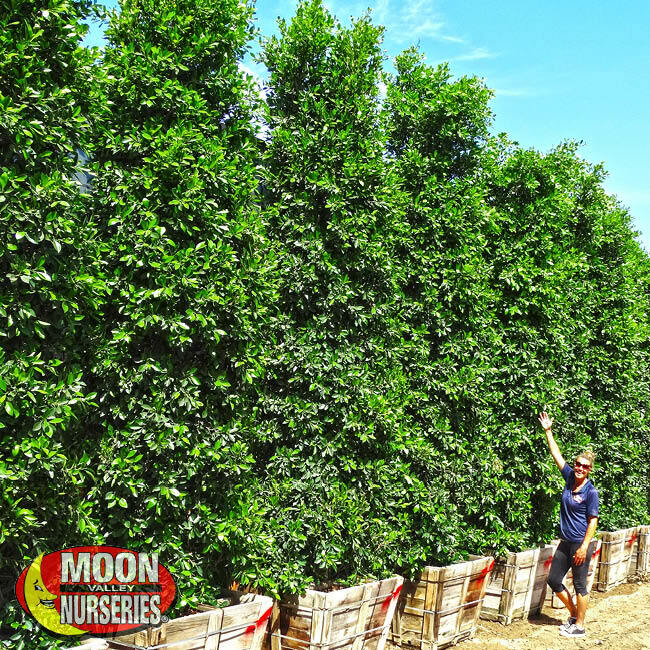 Moon Valley Nurseries is your one-stop shop for all your landscape needs. Our experts have decades worth of experience and they will be able to assist you with any projects or questions you may have regarding trees, shrubs, design, and more! Come by and check out the amazing trees and deals we have to offer our Arizona community.